Halloween is just around the corner and we have some very FUN and CREEPY experiments planned. Today’s experiment is making a magic bubbling potion. It’s very simple, yet very, very fun! Total Time: You can set this one up in about 5 minutes, but it lasts as long as you have dry ice and an interested audience! Difficulty: Use caution when handling dry ice. Be sure to wear gloves or scoop it up with a spoon. NEVER TOUCH DRY ICE WITH YOUR FINGERS! It will hurt. It will burn. It will give you frostbite. Put your glass of water on top of your cookie sheet or cake pan. This experiment tends to overflow a bit, so it’s nice to have something to catch the mess. Place a small piece of dry ice in the glass of water. This will immediately begin to produce carbon dioxide gas that looks like fog. If you want to color your water, drop 1-2 drops of food coloring into the water. Now squirt a bit of dish soap into your water. Within a couple of seconds it will produce massive amounts of fog-filled bubbles. Play to your heart’s content. Do a few magic spells over your magic bubbling potion. Dry ice is simply solid carbon dioxide. It has to be kept below -109.3 degrees Fahrenheit to stay a solid. (Now that’s cold!) The neat thing about dry ice is that it sublimes, meaning it changes directly from a solid to a gas at atmospheric pressure. 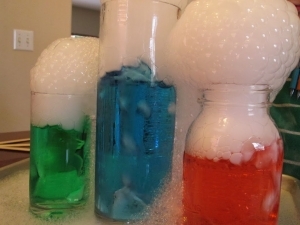 The bubbles you see coming from the dry ice in the water are simply carbon dioxide gas escaping into the air. 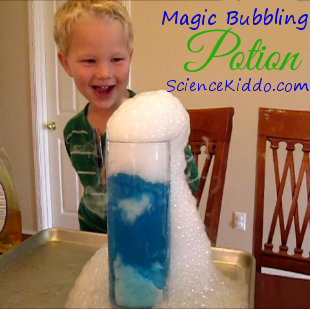 When you add dish soap to the mix, those gas bubbles are what blow the soap bubbles that you see overflowing the glass. Thanks to Steve Spangler Science for this great idea! So much fun! So exciting!